impulse heat sealers - industrial heavy duty table top heat sealers - 15”, 20”, 25” or 30” heat seal bar lengths. With pneumatic operated bars, can seal: poly bags, foil bags,Tyvek pouches, hospital sterilization bags. Built in the USA, heat sealing for industrial applications. Impulse heat sealers - controls include pressure regulator, separate heat seal and cool timers for the heat seal cycle. Heavy duty pneumatically operated impulse heat sealer for reliability and durability. Each impulse heat sealer will make heat seals that are hermetically sealed, - airtight and water tight. 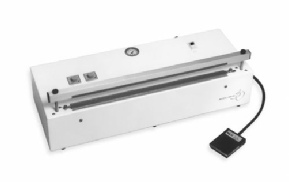 Each impulse heat sealer comes complete with a two-year warranty, detailed operating instructions and impulse heat sealer spare parts kit with Teflon tape and heat seal bands. 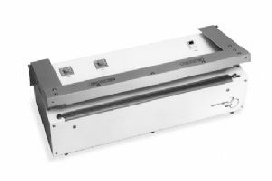 Two year warranty - impulse heat sealers are made in USA.